About 1000 Viking Orbiter red- and violet-filter images have been processed to provide global color coverage of Mars at a scale of 1 km/pixel. Individual image frames acquired during a single spacecraft revolution ("rev") were first processed through radiometric calibration, cosmetic cleanup, geometric control, reprojection, and mosaicking. We have produced a total of 57 "single-rev" mosaics. Phase angles range from 13 to 85 degrees. All of the mosaics are geometrically tied to the Mars Digital Image Model (MDIM), a black-and-white base map with a scale of 231 m/pixel. In producing a global mosaic from Viking images with useful color and albedo information for the surface, the largest challenge has been the photometric normalization, including removal of atmospheric effects. First, we selected a subset of single-rev mosaics that provide the best global coverage (the least atmospheric obscuration and seasonal frost). A Minnaert photometric normalization was applied to normalize the variations in illumination and viewing angles. Image data acquired at illumination or emission angles larger than 77 degrees were trimmed off, as these data are strongly affected by atmospheric scattering. A model image of condensate haze was created from the violet images, consisting of 60% of the violet-filter reflectance greater than 0.05, smoothed over 20-km scales. The haze model was then subtracted from both the violet- and red-filter images. The residual polar caps were excluded from haze removal. This procedure is "conservative" in the sense that it errs on the side of undercorrecting for the haze. Finally, these normalized mosaics were combined into global mosaics. Global coverage is about 98% complete in the red-filter mosaic and 95% complete in the violet-filter mosaic. A green-filter image was synthesized from an average of the red- and violet-filter data to complete a three-color set. References: * Eric Eliason, Raymond Batson, Anthony Manley, Mars Mosaicked Digital Image Model (MDIM) and Digital Terrain Model (DTM), "Mission to Mars", USA_NASA_PDS_VO_2001-2007, "VO1/VO2-M-VIS-5-DIM-V1.0", NASA Planetary Data System, 2001 , http://pdsimage.wr.usgs.gov/Missions/Viking_Orbiter/vo_2007/. * Kirk, R.L., Archinal, B.A., Lee, E.M., Davies, M.E., Colvin, T.R., and Duxbury, T.C., 2001, Global image mosaics of Mars: Assessment of geodetic accuracy, Lunar Planet. Sci., XXXII, Abstract #1856, Lunar and Planetary Institute, Houston (CD-ROM). * Batson, R.M., and E.M. Eliason, 1991, Digital Maps of Mars, Photogram. Eng. & Remote Sens., 61, 1499–1507. * Wu, S.S.C., and Doyle, F.J., 1990, Topographic mapping, in Greeley, Ronald, and Batson, R.M., eds., Planetary Mapping: New York, Cambridge University Press, p. 169-207. * Wu, S.S.C., and Schafer, F.J., 1984, Mars control network: American Society of Photogrammetry, in Technical papers of the 50th annual meeting of the American Society of Photogrammetry, vol. 2, Washington, D.C., March 11 - 16, 1984, p. 456-463. 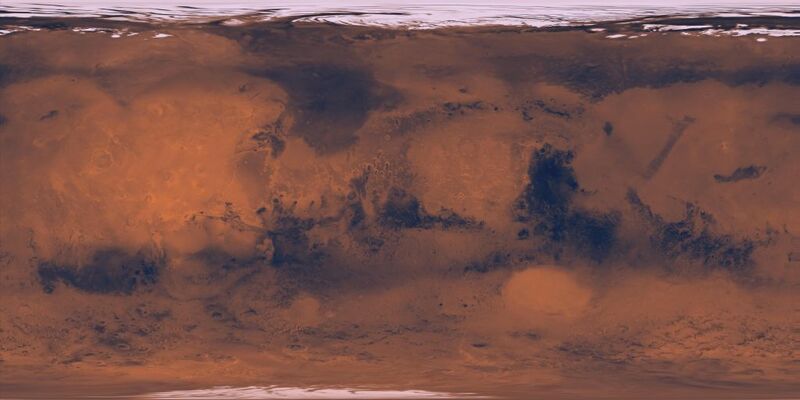 This Mars color mosaic incorporated roughly 1000 Viking Orbiter images and provides gap-free coverage of the Martian surface. As noted in the process description, images in the mosaic were obtained under a wide range of illumination conditions and were processed by a simple scheme intended to reduce but not eliminate differences in appearance of topographic features. Comparison of such features in different parts of the mosaic should therefore be considered only qualitative. The majority of the source images have resolutions in the range of 200 to 300 m/pixel, but images with resolutions as poor as 1000 m/pixel were used to fill gaps in a few areas. The accuracy of the original MDIM could not be evaluated at the time of its production, because of the lack of a suitable reference data set of higher accuracy. The precision of the control network on which the mosaic was based was estimated at 20 pixels (5 km) root-mean-square (RMS) (Batson and Eliason, 1991) Subsequent control networks and mosaics were later produced from the same images but with a number of improvements, primarily 1) use of Mars Orbiter Laser Altimeter (MOLA)-derived elevations (~10 m vertical accuracy) to constrain all network points; 2) use of MOLA-derived horizontal coordinates to constrain a globally distributed set of points; and 3) use of the MOLA elevations to orthorectify the images before mosaicking. Comparison of the coordinates for the center point of each image in MDIM 1.0 and in the later, MOLA-controlled product indicated mean differences of 0.16 km in easting and -1.01 km in northing, with RMS differences of 3.15 and 4.33 km. The contribution of errors in the MOLA coordinates (<0.1 km horizontal accuracy) and the later MDIM tied to it (~0.3 RMS accuracy relative to MOLA) contribute negligibly to this result. Note that some confusion exists in the literature over the systematic error of MDIM 1.0 in longitude. The mosaic was tied to an erroneous identification of the Viking 1 landing site approximately 0.2° from the true location, which would correspond to an error of ~12 km in easting, but this error was partly corrected by adjustment of the W0 rotational parameter to place the crater Airy 0 at zero longitude. Furthermore, comparisons between MDIM 1.0 and an intermediate solution (MDIM 2.0) partially tied to MOLA indicated a 6.7 km (0.11°) mean difference in longitude. This difference was attributed primarily to errors in MDIM 1.0 but in fact was primarily an error in MDIM 2.0, with MOLA and the final MDIM 2.1 control solution coincidentally quite close to the original product. This Mars mosaicked digital image model (MDIM) incorporated roughly 4600 Viking Orbiter images and provides gap-free coverage of the Marian surface. Cartographic experts at the USGS Astrogeology Science Center in Flagstaff, Ariz., created the MDIM mosaic. The images underwent noise removal, radiometric, geometric and photometric correction, reseau removal, and tone matching. The ground control points were established based on a low resolution mosaic produced at USGS under the direction of Sherman Wu. In addition to the ground points, a network of tie points was collected between all identifiable overlapping images, making sure that all four sides were tack to other images. Once the camera pointing was updated for a set of images, the updated camera pointing information was saved and stored so for later access if necessary. The images with the corrected geometry were projected to a sinusoidal equal area projection and mosaicked together. The tones were matched using a highpass and lowpass filtering technique to simulate a photometric correction. The images used in MDIM 1.0 were obtained over wide ranges of incidence and phase angles and atmospheric haze. As a result, it was not possible to preserve the radiometric integrity of the observations and simultaneously produce a uniform representation of the Martian surface. Instead, a simple radiometric-photometric processing approach was used that yielded a mosaic with reasonably uniform brightness and contrast. In particular, the differences in the contrast of topographic features of similar slope that were imaged at different incidence angles have been reduced. This processing consisted of highpass spatial filtering to suppress regional-scale albedo variations and gradients in illumination, followed by normalization of the slope-dependence of surface reflectance, based on a Lambert reflectance model. Because the processing was carried out on images with 8-bit integer pixel values, additional radiometric distortions such as contouring were introduced in areas of low original contrast.